Florida Memorial University recently received its certification as a Cessna Pilot Center. Josh Colton, manager of Cessna Pilot Centers, presented the official plaque to Capt. A. J. Tolbert, chair of the Department of Aviation & Safety and a 21-year veteran of American Airlines, to recognize FMU as the third university in the nation to earn this distinction. For more than 80 years, Cessna has been a leading general aviation manufacturer. Its partnership with FMU brings to the university’s aviation program a broad spectrum of benefits, including the opportunity for students to fly FMU’s Cessna 172 SP G1000 aircraft at a discounted rate, access to a leading industry curriculum, and opportunities to obtain a degree while pursuing a pilot’s license. The Cessna Pilot Center certification authorizes the university to incorporate the Cessna Flight Training Program into its lesson plans. This comprehensive flight training program is recognized in the aviation industry for producing competent and confident new pilots. FMU will also benefit from member exclusive seminars and supplementary programs. FMU’s aviation students pay $ 124 per hour (wet) to rent the aircraft—a considerably lower rate in comparison to that of other institutions, which charge much more for the same equipment. Another advantage is that the costs of ground school can now be covered by student loans, says Capt. Tolbert. Approximately 80 students study aviation & safety at the university. “Students here are getting a first class ground school,” Tolbert says. Ground school teaches the students about airspace, radio calls, the aircraft systems, how the aircraft works, how it flies, and the rules and regulations of operating in the skies of the national airplace system,” says the captain. The partnership goes into effect immediately. 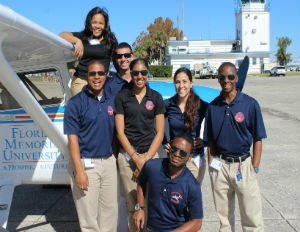 For more information about Florida Memorial University and its aviation programs, visit its website. Retired UPS senior executive Calvin E. Tyler Jr. and his wife, Tina, nationally known philanthropists, announced a $ 5 million gift to Morgan State University for an endowed scholarship fund established in their name at MSU. The fund provides need-based scholarships that cover full tuition for select Morgan students who reside in Baltimore City, the Tylers’ hometown. The couple’s contribution is the largest individual donation in the school’s history, and is believed to be the fifth largest from an individual to any historically black college. Calvin Tyler was the first person in his family to attend college when he entered Morgan to study business administration in 1961. But he had to interrupt his higher education in 1963 because he lacked the funds to continue. He took a job as one of the first 10 drivers at UPS in Baltimore in 1964, during the company’s early days. Two years later, he became a UPS manager and, with much hard work and sacrifice—his own and his family’s—he climbed the corporate ladder, joining the company’s board of directors and becoming senior vice president of operations, the position from which he retired in 1998. Cheryl Y. Hitchcock, Morgan’s vice president for Institutional Advancement, pointed out that 90% of the university’s students receive financial aid. Morgan State University, founded in 1867, is a Carnegie-classified Doctoral Research Institution offering more than 70 academic programs leading to bachelor’s degrees as well as programs at the master’s and doctoral levels. Its student body is multiracial and multi-ethnic.